Officially known as the new Motorola Moto X or Moto X Second Generation, Motorola's updated version of the X handset takes the formula established with the original Moto X and improves on it to be a bit more competitive with current flagship devices. The most obvious thing to notice is that the new Moto X has a much bigger display, a 5.2" 1080 x 1920 pixel OLED panel with a Gorilla Glass 3 coating, this makes it a significantly bigger device at 141 x 72 x 10mm and 144 grams in weight, about 20% bigger and 10% heavier than the original. But of course, all the other features have been heavily upgraded too. On the back is a 13 megapixel camera with 2160p (4K) video capture capabilities, on the front is a 2 megapixel one that can capture 1080p video. Inside is a quad-core 2.5GHz CPU with 2GB of RAM with 16GB of flash storage as standard (32GB is available from the Motomaker store), but there's no mention of a microSD slot. This is an LTE capable device, and the previous version supported NFC so we assume this does although it is not mentioned. Because this is a high-end Android 4.4 smartphone then it includes basically all the features that those other smartphones do too. One unique feature is the Motomaker store that allows a degree of customisation, including a range of custom backs (including real wood and leather) and a choice of 16GB or 32GB of storage. 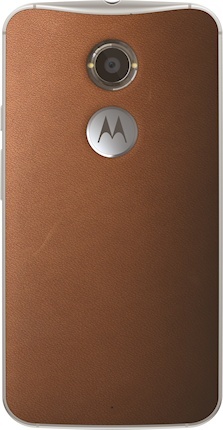 There isn't the same degree of customisation as with the previous model, but you can choose between 25 different backs plus laser etching to make your Moto X unique. The user interface is very much stock Android, the way Google intended it to be. Of course, you can customise the Moto X with add-ons from the Google Play Store if you want. 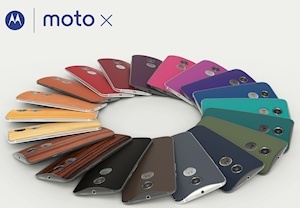 The new Moto X should start to be available starting later this month in the Americas, Europe and Asia. In the US the SIM-free price is $500 (presumably for the base configuration) which is a fair bit cheaper than the $620 street price for the iPhone 5s and cheaper than most of the flagship Android competition too. It's hard to say exactly how that will translate to prices in Europe. The new Moto X is a timely release from Motorola who are beginning to see something of a renaissance with their value Android handset range, and it is certainly very competitive with the competition when you take the lower price tag into account.